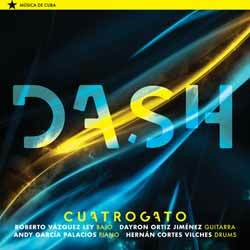 Ansonica Records release Cuatrogato's (Four Cats) Dash, a funky fusion of Cuban folk, jazz and rock music. Dash is comprised of Roberto Vázquez Ley (bass), Dayron Ortiz Jiménez (guitar), Andy GArcía Palacios (piano) and Hernán Cortes Vilches (drums). It's hard not to be sucked in by this release as the 5 tracks (24 min, 04 sec) are infectious. The only complaint I had was that it was way too short.